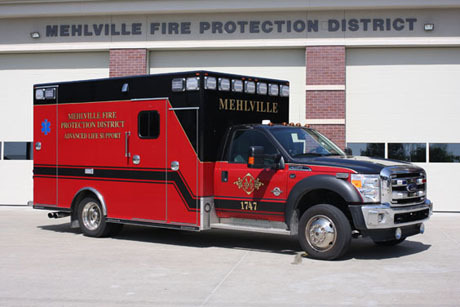 Mehlville Fire Protection District runs five life support vehicles 24/7 and a sixth LSV which is in service when District manpower allows. 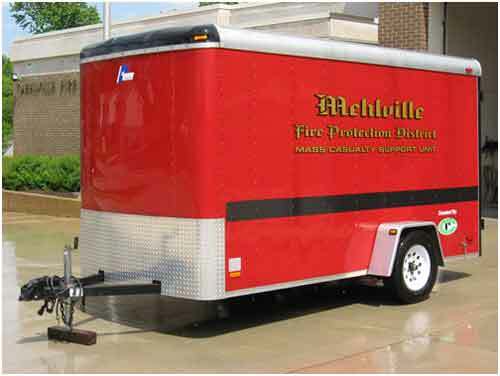 In 2009, MFPD added to its fleet two new ambulances, with lighter Chevrolet chassis'. 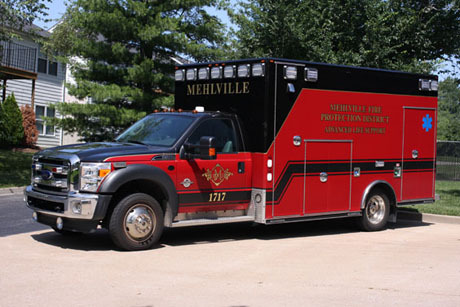 In late 2011, MFPD added another ambulance that is a Ford F-450 four-wheel-drive MedTec Ambulance. 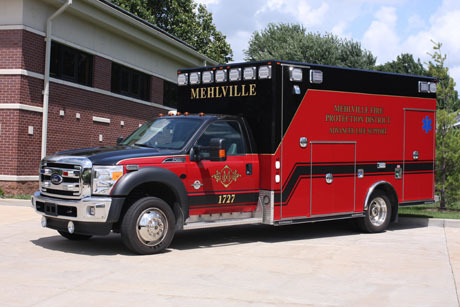 Due to the varying terrains which encompass the District, EMS personnel wanted to include increased service capabilities by adding the "all wheel" drive concept to the District's ambulance operations. In 2012, MFPD added two more Ford F-450's to the fleet. 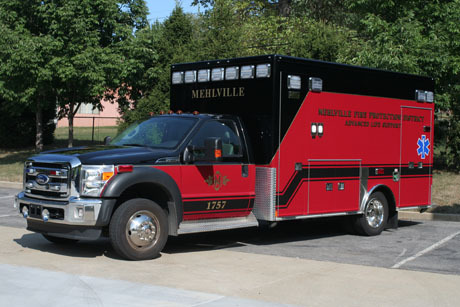 The Ford F-450 chassis has also allowed MFPD a savings of approximately $35,000, per ambulance, over that of the medium chassis the District utilized prior to 2009. Fuel economy is greater due to the smaller chassis on the life support vehicle. 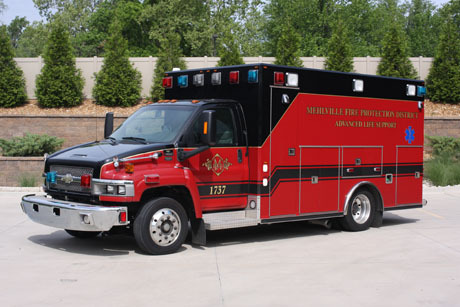 Time will certainly be a determining factor in deciding whether the District will be able to continue its ambulance services with the lighter chassis. The patient compartment of these vehicles is ergonomically designed to better assist District paramedics in the overall treatment of their patients by organizing drawers and cabinets which contain treatment adjuncts and medications to increase efficiencies in the total patient care environment. The ambulance also has an inverter which allows for 120 volt electrical capabilities to provide electrical service for equipment charging and home healthcare equipment that is becoming much more prevalent in the community. Rotating emergency lights have been eliminated from the life support vehicle because they utilize too much voltage which requires enhanced equipment and a larger alternator. Most of the lighting on the vehicle is LED which improves efficiency and also makes the vehicle more easily seen by motorists. These new F-450s can now be serviced and have warranty work performed on them in the District. This allows for repairs and warranty work to be accomplished more quickly thereby keeping the unit out of service for less time. These units have an Air Ride Suspension System, in the patient care compartment, which allows for a much smoother ride and more comfort for the patient. Ford has a "dump system" which is part of the Air Ride System that allows the chassis and patient compartment to lower in order to facilitate safer and more efficient patient loading and unloading. 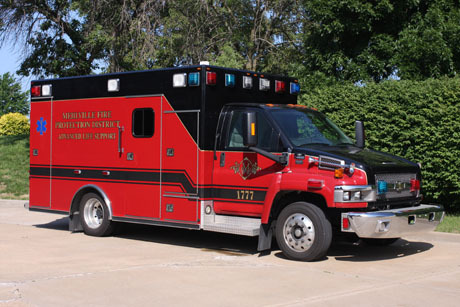 The District plans to continue to purchase the same type of ambulance, if possible, so that the patient care compartments are the same regardless of which ambulance a paramedic is scheduled to be working. This concept simplifies training so that a paramedic does not have to know six different styles of ambulances. This method creates training continuity for employees and ensures the best possible patient care.